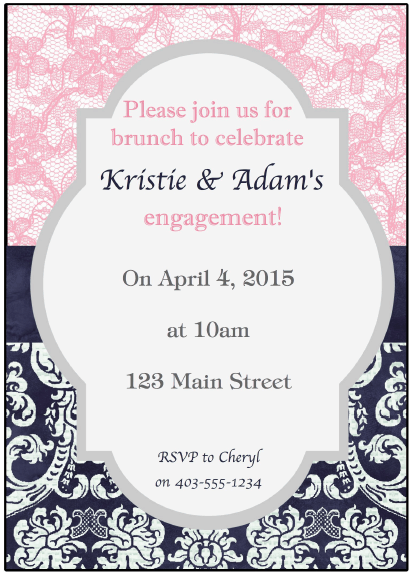 Hosting a brunch is a great way to celebrate a birthday, engagement, bridal shower, baby shower…the list goes on! It’s a theme that’s great for all ages so it’s perfect for occasions like bridal showers where you have everyone from children to grandmas in attendance. With so many delicious menu options like muffins, cinnamon buns, scones, cookies, tea and more, it’s a really easy party to plan. 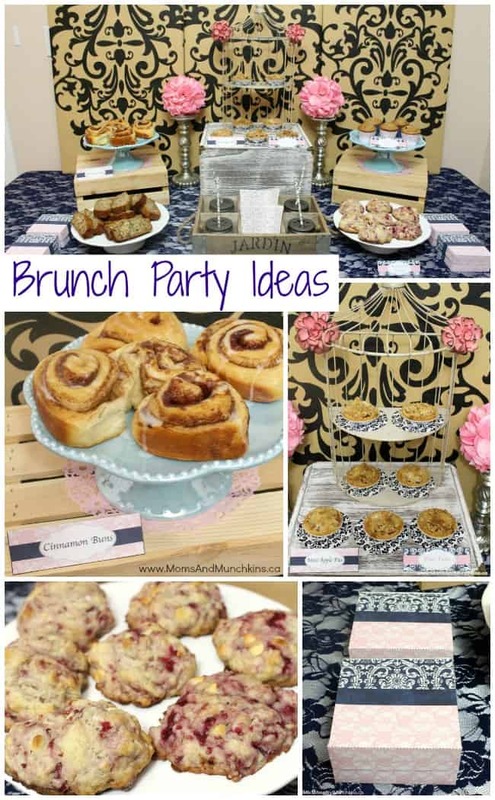 In this collection of brunch party ideas, we’ll include ideas for food, decorating and printable party supplies. I hope you already ate breakfast because I have a feeling that your tummy is going to start rumbling soon! For this party, I went with a pink & navy color combination. I think the colors are perfect together! 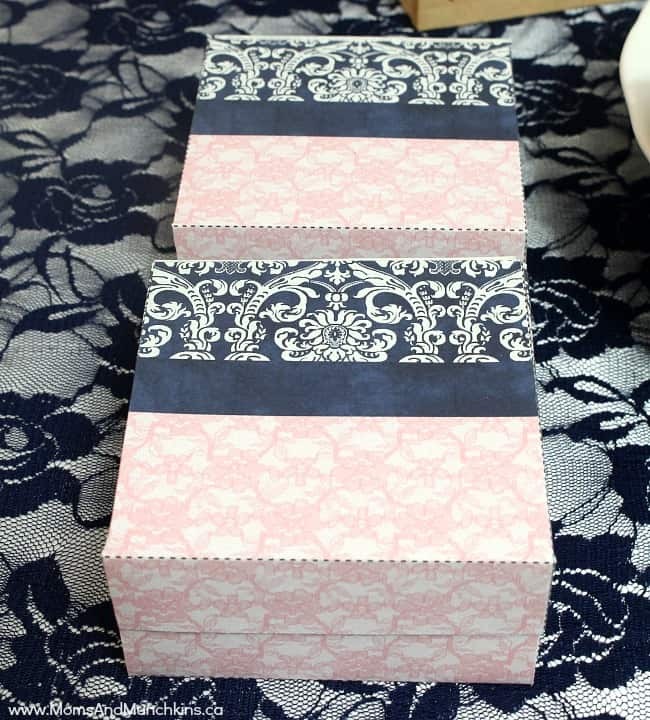 To give it a more feminine look, I used a lot of lace and damask prints. One of my favorite ways to set the backdrop for a party table is by wrapping foam boards in wrapping paper. It’s super easy to do and really inexpensive too! 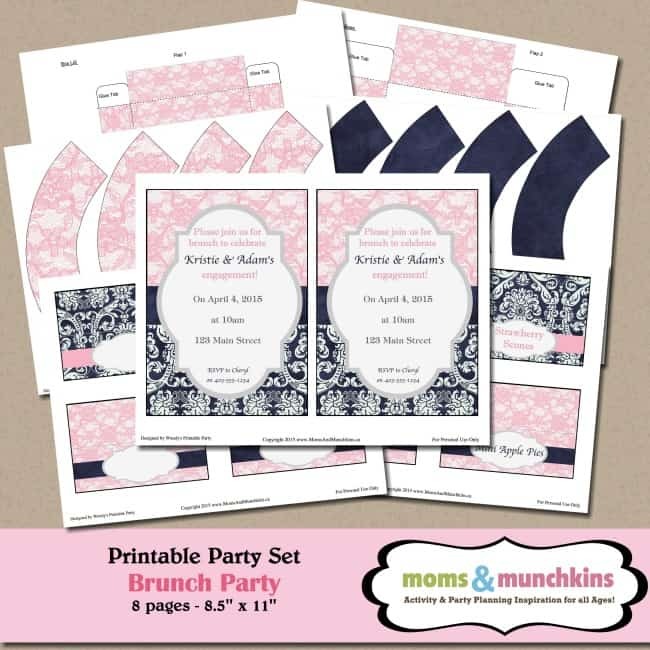 In our printable party set, we’ll customize the invitation for you with your party details. Now onto one of my favorite parts of any party – the food! 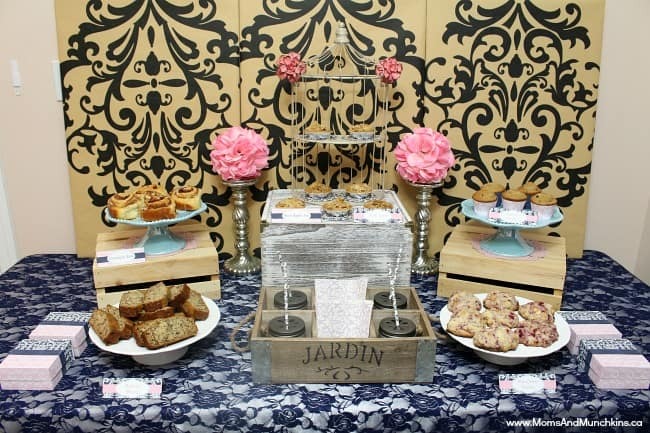 There are so many delicious ideas for a brunch-themed party! You could go with hot menu items like scrambled eggs, sausages, bacon and hashbrowns or with a bakery-style table like I’ve done here. 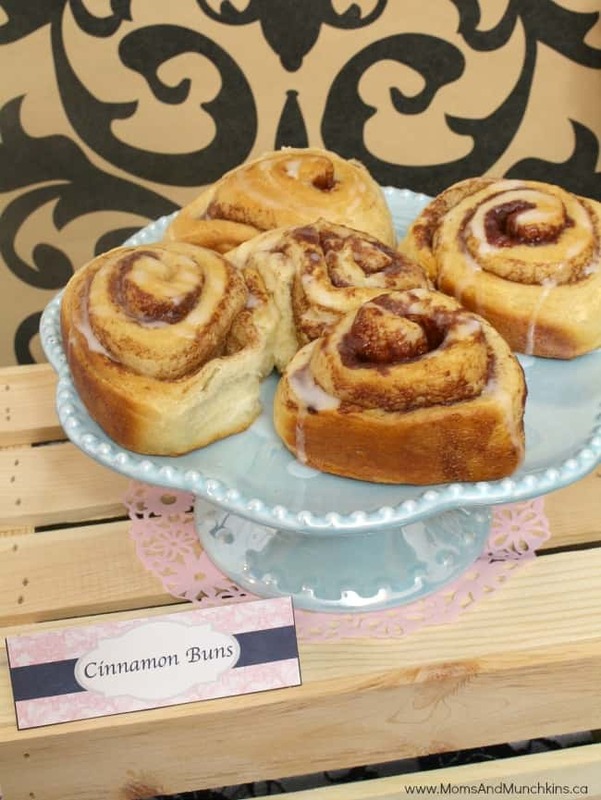 I cheated a little on these cinnamon buns and purchased a prepackaged mix that just had to be baked. 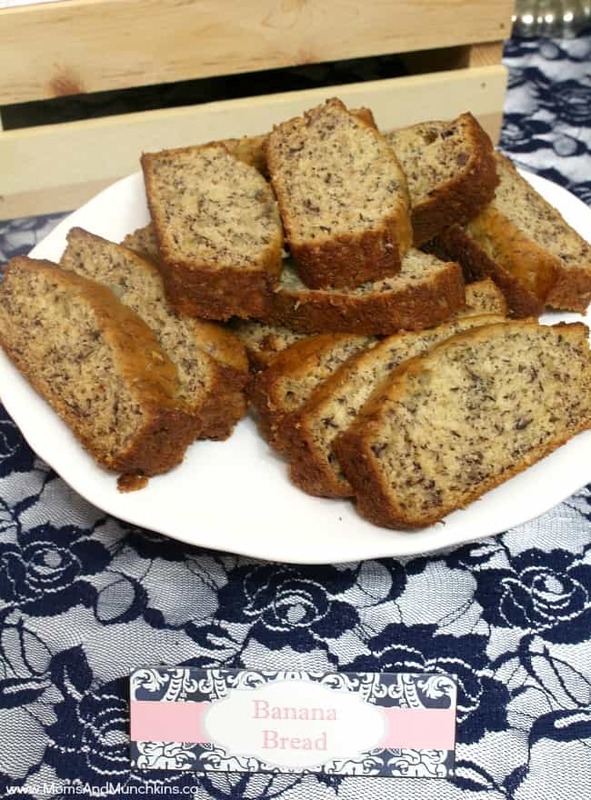 For the banana bread, I used my son’s favorite banana bread recipe. It never lasts long in our house! These scones are a new recipe I tried but they were so tasty that I’ll be making them again soon! 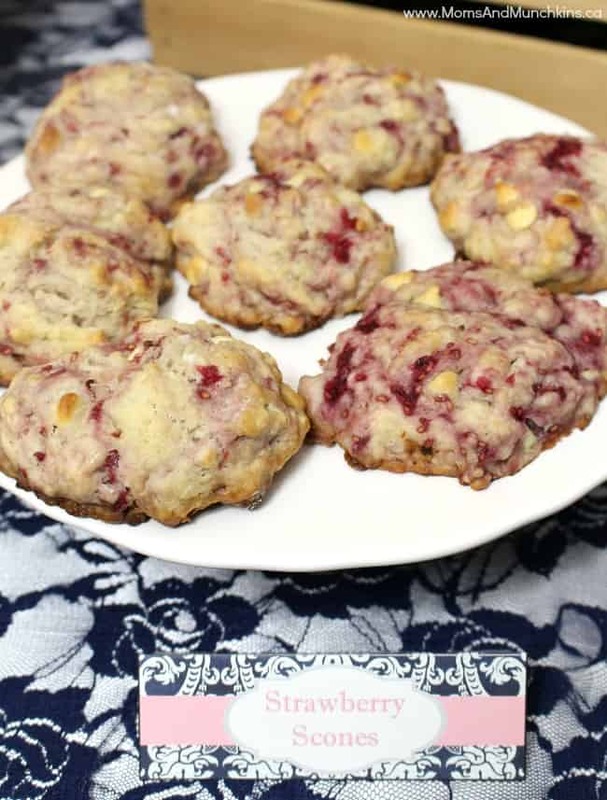 The sign says Strawberry Scones but I actually made Raspberry White Chocolate Scones for this party. 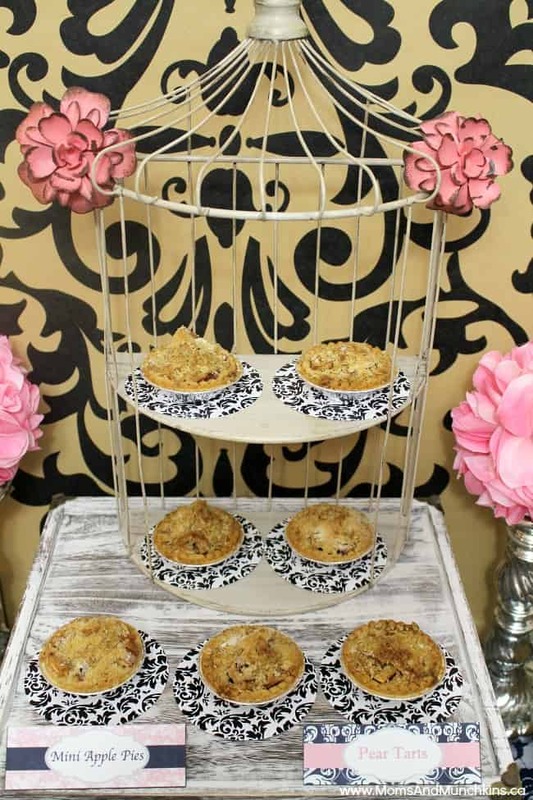 These Mini Apple Pies are a favorite in our house! They are great as a dessert on Thanksgiving too! I cheated again and bought prepared blueberry muffins. You don’t have to make everything from scratch when you have so many party details to take care of. 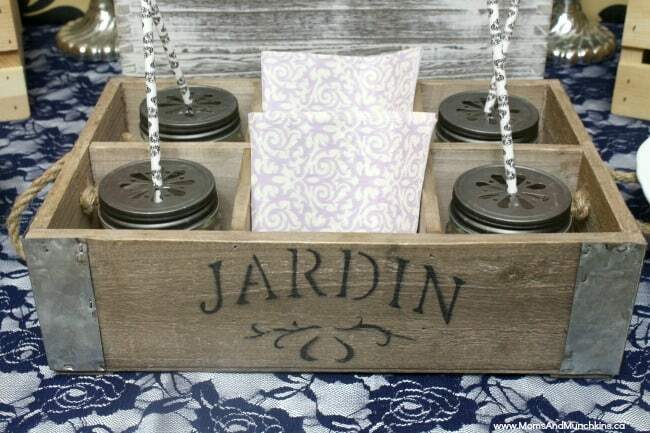 The party had a shabby chic style with wooden boxes, mason jars, damask prints, doilies and more. 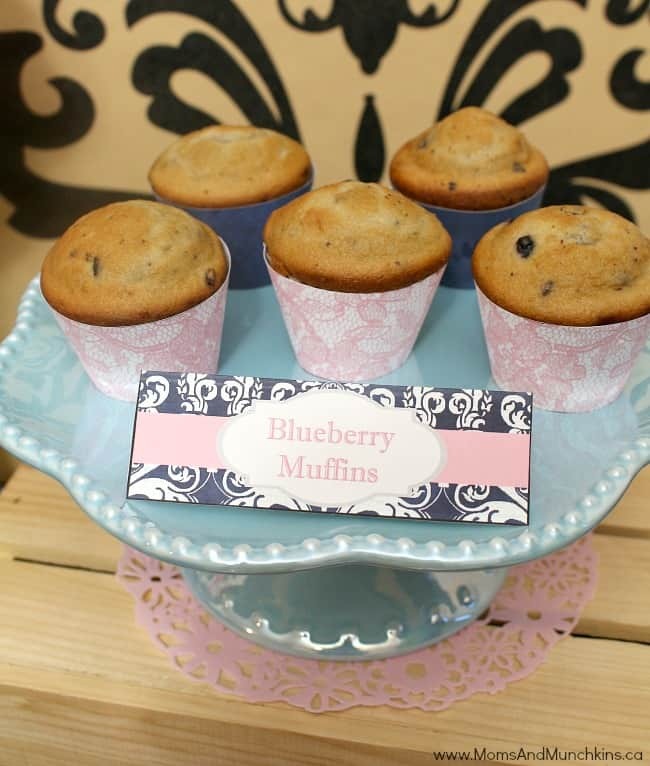 You can also send guests home with some delicious sweets in these printable bakery style treat boxes. This brunch party set is available in our Etsy shop. Thank you to the fabulous Wendy’s Printable Party for designing these for us! We’d love to see pictures of your brunch parties! Give us a shout on Twitter or Instagram with your party photos! We’re always adding new party ideas & recipes! Never miss an update by following us on Facebook, Twitter, Pinterest, Google + and Bloglovin’. This is such a pretty party! I really need to try that delicious looking scone recipe out.